My sister, Jen, and I have been doing more cooking recently, so Mom let us cook Christmas Eve dinner. We cooked for 9 people including ourselves and stayed (barely) within our self-imposed budget of $20 a person. We tried to mix some fancy meats with lighter, healthier fare. Recipes may follow if I ever get around to it. 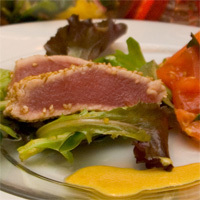 Pan-seared sesame-crusted tuna on a bed of mixed greens with mango-sesame dressing. I bought a mango just for fun and ended up processing some of it with sesame oil, sesame seeds, and a tiny bit of mustard. The tuna was fast, simple, and tasty (and expensive, at $18/pound for Whole Foods sushi-grade tuna). We served it along with a sauce consisting of Dijon mustard, sesame oil, and a dash of wasabi. Tomato and basil salad. This started out as insalata caprese, but we discovered that fresh mozzarella was nowhere to be found. Tossed with olive oil and a bit of ground pepper. 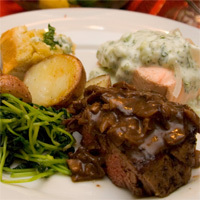 Pepper-crusted beef tenderloin with mushroom bordelaise sauce. Based on a recipe that was based on a Cooks’ Illustrated recipe. The pepper didn’t stick that well, but with the help of our handy meat thermometer it was cooked to perfection in my sister’s cast iron pot. Poached salmon with cucumber dill yogurt sauce.. A very light, healthy, and tasty way to cook salmon. Poaching for 10 minutes cooked the fish to perfection so that the middle was still a bit on the pink side (and very tender). The sauce was quite good as well. I’m becoming a huge fan of dill on fish. Garlic bread. Toasted, with lots of garlic and some parmesan cheese. Wilted spinach, watercress, and orange salad. My favorite salad, and everyone else liked it too. Roasted potatoes. Small potatoes, halved and prepared with olive oil, kosher salt, and ground pepper. Chocolate cake, With green Christmas frosting and sprinkles, of course. Tiramisu. Good ol’ Trader Joe’s. Vanilla ice cream. Good with just about everything. Success at last! We finally convinced my dad to pick up a controller to give tennis a try. He played against some friends of ours who were over for Christmas Eve dinner. My mom and dad teamed up and put up a great fight before losing 3-2. 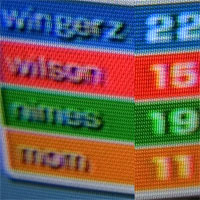 In other Wii news, Wilson got a hole-in-one on Hole 2 (par 3). 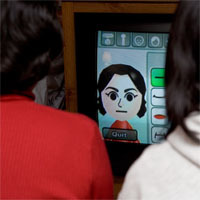 One thing that I find really amazing: people aren’t necessarily falling in love with the Wii – they’re falling for Wii Sports, a glorified tech demo. I get the impression that a lot of people are dropping $400 to play it, despite the fact that most of the in-game Miis only have a single sphere-shaped hand (with no arms). I’d guess that a lot of buyers have no idea of what’s in the release pipeline, but I suppose the Nintendo brand goes a long way. I wonder what future game(s) will have the universal appeal of the pack-in. Hopefully there will be a steady stream of great mainstream titles in addition to the more gamer-oriented stuff. Ceida brought over some desserts from Mike’s Pastry the other night and left a cannoli with us. The next morning, caught in a mad rush to get to the airport, I couldn’t bear the thought of trashing it. Only one idea popped into my head: I put it in my jacket pocket. It made the trip intact, sort of. Fortunately, it was still delicious. Virtual Console Tennis: What’s the point? Nintendo’s virtual console releases this week included Tennis for the NES. Yup, the old one, with the 8-bit graphics and non-motion-sensing controls (not to mention that you have to move your own character around). Honestly though, what’s the point of this? When someone asks you to play a game of tennis on the Wii, who in their right mind would think of the NES release over Wii Sports Tennis? I’m completely baffled and would love to see the rationale behind some of these releases. Since it hasn’t materialized on the DS yet, here’s my dream for the Wii VC: Networked multiplayer Tetris Attack, with a Tetris DS-styled ranking system. I started gaming in the late 80s. Over the past two decades, the only time my mom ever picked up a controller is while cleaning up after me. 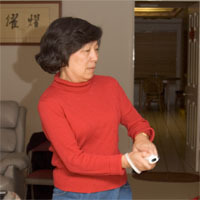 After hearing about Wii family success stories, I figured I had a pretty good shot at getting my mom to give it a try. I made my sister create a Mii first so that Mom could see how easy it was. Then she created her own, giggling as she clicked on some of the sillier noses and mouths. We started out with a few rounds of tennis. Mom played the way she used to play real tennis – by swinging with a big upwards component, which translated into lobs on-screen. Her timing was a little off, but she hit most of the balls that came her way and we won a few matches against my sister and Wilson. Then we played three holes of golf. Egged on by my sister, I went for the small island of green on Hole 3 and quickly hit the 15-stroke maximum. It was pretty disheartening, but meanwhile Mom beat all of us (check out the intense look of concentration). Hoping to get my dad to give it a try later; he was off napping somewhere. In related news, Wii Sports was named Gamasutra’s most important game of 2006. I can’t argue with the award, since I’ve seen it capture the attention of people who traditionally don’t play video games, including our upstairs neighbors, our VP, and Mom. Two days ago, Nintendo made the Wii Weather Channel available. It’s a pretty nifty little application that lets you explore weather all around the globe, letting you rotate and zoom in and out. Sure, data-wise it’s not anything that you can’t do on weather.com, but it’s a lot more fun to rotate all the way over to the South Pole (it’s pretty cold down there) than to visit a website. No custom locations. Figuring out your latitude and longitude is pretty easy nowadays. Let users enter custom locations. Better yet, do a geo-lookup based on a Wii’s IP address, and show registered friends on the map. As a complete aside, use the geo-lookup in games so that you’ll know you’re playing with people all around the world (right now the only time I think I might be playing someone not from the US is when they have a kanji-filled handle). Panning/rotating with the ‘A’ button. In the other channels, usually you hold down ‘B’ to pan the view. Switching it to ‘A’ for the weather channel is a bit disconcerting. Overall, I wish the channels had a more consistent look and feel. No lookup by name. Would love to be able to enter a zip code or place name to get weather reports. This has the added benefit of making me not look stupid when someone asks me for the weather in a particular city and I have no idea of what continent it’s on. In any case, it’s fun to play around with and didn’t cost anything. Hopefully Nintendo will release other map-related channels, since everyone loves them. For the past few weeks I’ve used my Sunday evening to try various ATK recipes. Now that I have The New Best Recipe, I have even more recipes to choose from. I’m trying to expand my salad repertoire in an effort to get Jen to eat more vegetables. I remembered seeing a beautiful pear and endive salad a few weeks ago, so the arugula and pear salad in NBR caught my eye. This was a very tasty salad, and I really liked the pears – I didn’t give all of them enough time to brown all the way through because I was impatient, but even so they had a thin candy-like coating. The pears may be roasted up to 3 hours in advance, but keep them at room temperature until serving time because refrigeration adversely affects their texture. Warm pears work nicely in this salad, too. 1. Adjust an oven rack to the lower-middle position, place a baking sheet or broiler pan bottom on the rack, and heat the oven to 500 degrees. 2. For the pears: Peel and halve each pear lengthwise. With a paring knife or melon baller, remove the core. Set each half cut-side down and slice lengthwise into fifths. Put the slices in a large bowl and toss with the butter; add the sugar and toss again to combine. Spread the pears in a single layer on the preheated baking sheet, making sure each slice lies flat. Roast until browned on the bottom, about 10 minutes. Flip each slice and roast until tender and deep golden brow, about 5 minutes longer. Remove from the oven and set aside to cool. 3. For the vinaigrette: Whisk the oil, vinegar, salt, and pepper to taste together in a small bowl. 4. For the salad: Combine the arugula, reserved pear slices, and cheese in a large serving bowl. 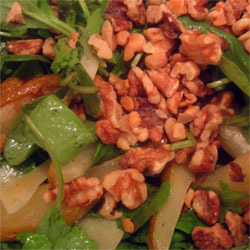 Add the vinaigrette and toss gently to combine, sprinkle with chopped walnuts. Serve immediately. I ended up running a bunch of errands today. It was a gorgeous day (considering that it is mid-December), so I biked from home to Harvard to Davis to Porter and back, snapping a few pictures along the way. I spent some time at the Porter Square Books reading a book containing some basic DSLR tips (most of which were new to me). I feel like I’m slowly becoming familiar with the camera, though at times I’ll forget to set the ISO after tweaking the other settings. I can’t imagine having to learn photography using a film camera. Actually, I can imagine it: I’d develop my photos and they would all be terrible. Oftentimes it takes me a handful of tries before I get a decent exposure. In that respect, having a digital camera is wonderful because it provides instant feedback. It’s also cool that you can set it to automatically take the same picture with different levels of exposure, removing some of the guesswork involved. My CompactFlash card hasn’t arrived yet, so I’m stuck with the 256MB card from our old camera. It’s getting me into the good habit of being picky with which pictures to keep as I take them. Oh, and of course I’ve tried taking pictures of food: carrot cake and chicken curry. When I first got my DS, I was itching to buy games that utilized the touch screen. There weren’t a lot of games before the Mario Kart, Tetris, Animal Crossing, and Metroid onslaught. In acts of desperation, I got Feel the Magic, Yoshi Touch and Go, and Zoo Keeper. They were all reasonably amusing, but they weren’t really substantial gaming experiences. Their gameplay elements made them feel like tech demos. I’m trying not to make the same mistake again with the Wii, even though there are a few games that I’m sure I would enjoy (maybe I’ll pick them up later). Time and money constraints make it a bit easier to convince myself not to buy anything just yet. Next year is when a lot of the big titles start getting released, starting with Wario Ware: Smooth Moves. Meanwhile, Lee and I have carried out our PS2 for GameCube exchange since our new systems are backwards compatible. While I love Nintendo and wouldn’t trade Mario, Zelda, and Metroid for anything, there’s no doubt that the PS2’s library has more AAA titles. I’m definitely looking forward to playing God of War, Okami, Shadow of the Colossus, and Katamari Damacy. Oh, and FFX. Unfortunately, I have no idea of where all of these extra hours are coming from. 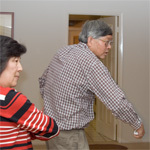 In other Wii news, 1) Jen’s Mom called us to tell us to be careful with the Wii after reading about injuries and damage it in the newspaper and 2) when I was talking to the upstairs neighbors about it, they had already played it at a friend’s house. I’m sort of wondering what the scene will be like tomorrow morning, with more units becoming available. With Christmas right around the corner, I’m thinking it’s going to be pretty crazy no matter how many units retailers have been hoarding for the last two weeks.